Pioneers in the industry, we offer flexo printing machine from India. Non Woven Roll to Roll Flexo Printing Machine are ideal for printing various images, designs and patterns of different colors on non woven fabric. 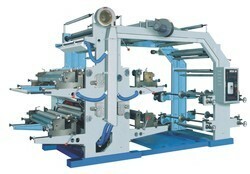 This machine is available in two modules in 2 color & 4 color. This machine is heavy duty built with cast iron material, can print a variety of materials, such as Non woven, plastic and paper etc. Four Color Flexo Printing Machine, adopting rubber or photosensitive resin as printing plate, is commonly known as the flexographic printing machine. It is a kind of ideal printing equipment for producing paper packing bag for food, supermarket handbag, vest bag and clothes bag, etc. 360Â° continuous and adjustable longitudinal register device.